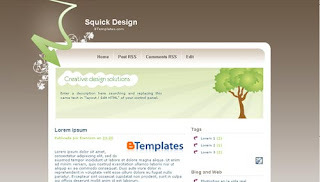 In 2008 we saw a surge in the quantity and sheer quality of free Blogger templates made available for us to download. Now that designers are turning their attention towards designing for this free blogging system, we can only expect this trend for increased quality to extend far into the new year. Over the past twelve months I've published several posts offering collections of free Blogger templates for you to download. 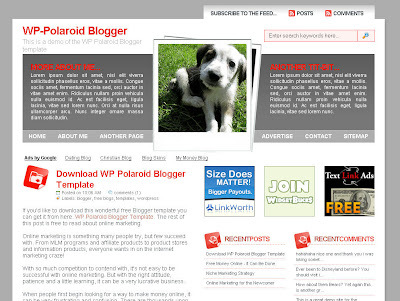 However, there are certain templates which are simply outstanding: the cream of the crop, which have proved their worth as the best Blogger templates of 2008. 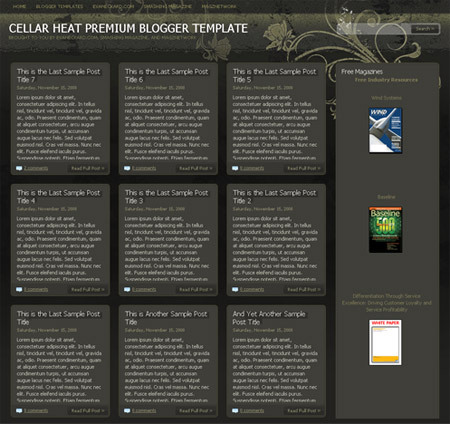 Here is my personal selection of the 20 best Blogger templates from 2008 (in no particular order or preference!) with previews and links to their download sites. I hope you will enjoy browsing through these templates if you are searching for an ideal template for your blogging project or simply to be inspired by great design. Antonio Lupetti's fabulous design is exclusively available for use with Blogger templates. Featuring a magazine style layout with many useful features, this clean and professional design provides the perfect canvas for business, design and magazine style blogs. 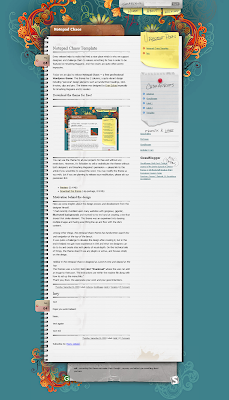 I must point out that this template is an advanced layout, and you will need to be familiar with the Blogger and HTML code if you intend to use this as much editing is required for this template to function properly. In any case, this is one of my favorite templates ever created for Blogger, and I'm sure most of you will love this design as much as I do too! This stunning template is a conversion of the Wordpress template by Vinh Le and includes many useful customizations. 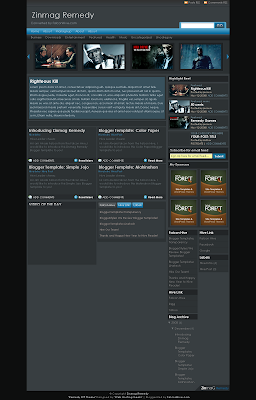 The footer section is fully widgetized while the sidebar contains integrated widgets for recent posts and comments. I loved the original striking style of the original Wordpress theme so I personally was thrilled to see this template ported over to Blogger! Here is a truly stunning, grunge style design which was converted from the Wordpress theme distributed through Smashing Magazine. Besides the stunning header section, this design offers styling of appropriate widgets in the sidebar; tabs for the date headings, and an informational section in the footer. GosuBlogger has done a great job of this conversion to ensure no functions have been lost in the conversion and that new widgets can be added with just a few clicks. This dark grunge style template is made to appear printed on colored paper. It features a fully widgetized sidebar, integrated search function and tabs for the date headings. I've only recently discovered Alvaris Falcon's beautiful selection of Blogger templates but I'm sure his talents will spread his fame as a Blogger template designer throughout this next year! 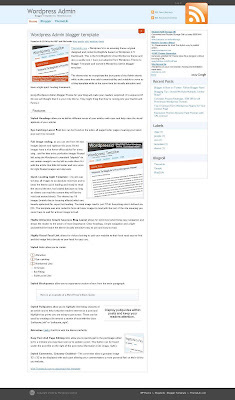 Here is another stunning Blogger template by GosuBlogger which is converted from the Wordpress theme by DT Website Templates. This template uses a striking background image for the header section, tabs for navigation, an integrated Flickr photostream and fully widgetized sidebar. 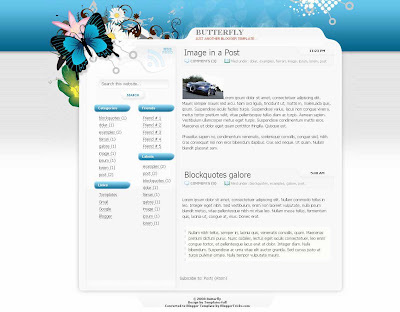 Brian Gardner's themes for Wordpress are among the most popular available and virtually revolutionized the WP theme market. 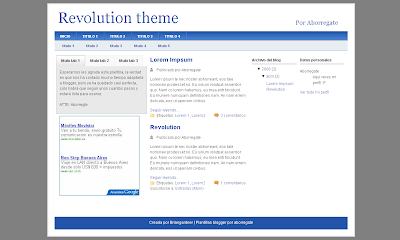 Aborregate's conversion of the classic Revolution theme for Blogger provices a highly useful, functional and customizable layout with an air of professionalism which makes it ideal for the business minded blogger. 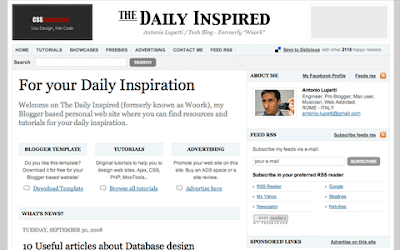 This theme includes tabbed navigation in the sidebar, a three column layout and stylized icons for post meta data. Aborregate's site seems to be down at the moment, so instead I have provided links to the demo and download locations on BTemplates.com (the premier collaboration site for free Blogger templates). Since it's release in January last year, the WP Polaroid conversion of Adii's Wordpress theme has proved one of the most used Blogger templates ever - and for good reasons! This wide two column template is the ideal solution for a portfolio or showcase site, with space in the header section for information about the site, integrated ads above the sidebar and a sllit widgetised sidebar section with custom images for each heading. This is a truly stunning template when seen live in action. Converted from the template designed by Jinsona Design, this layout features a fantastic slideshow below the header (great for showcasing feature posts), a truly magazine-style layout and even a video section on the home page. 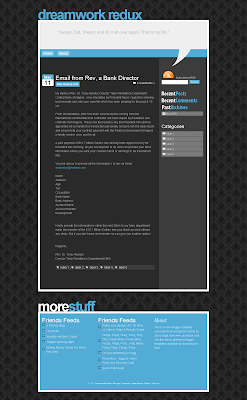 Please do take a look at this template in action as I personally am awed at the excellent job Alvaris has made with this conversion for Blogger! This screenshot does not give justice to the excellent functions included in this design! This beautifully simple theme was converted from the Wordpress template by Blog Oh Blog and offers a clean yet professional layout with tabbed navigation in the sidebar, icons for lists and stylish icons throughout. Here is another template offering a definite "WoW" effect! Origanally created by Malleika Attawel for Smashing Magazine, this template features a stunning header image and colorful layout with plenty of room for all your favorite widgets. This beautiful template features a stunning vector style header and two column sidebar for your widgets and advertisements and was converted from the original theme by Templates4All. Although this theme offers simple functions, the beauty fo the design has ensured this template is a popular choice for Blogger users. Here is another amazing template conversion by Alvaris of Falcom Hive. Featuring a colorful bar set against a dark grey background, this template offers a professional yet wholly useful approach for Blogger template design. 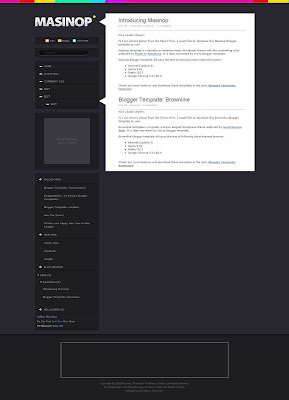 The sidebar is fully widgetised with an integrated search bar and a section for important blog links, while the footer offers space for advertising or an "About this site" paragraph. 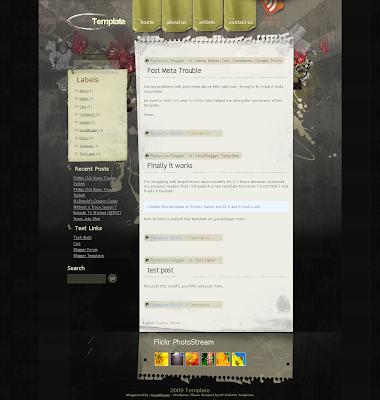 Here is an unusual and wholly elegant theme conversion from ThemeLib. This Wordpress Admin styled template is designed to mimic the Wordpress dashboard while offering a fully useful approach to the Blogger layout. I love the simplicity and professional style of this theme, and those icons for comment counts of each post are the perfect finishing touch. This elegant design was converted from the original template by Web Page Design and offers a clean, vector style layout with space beneath the header for your company motto or introduction. This beautiful template features a two column layout, integrated RSS feed icon and search functions. 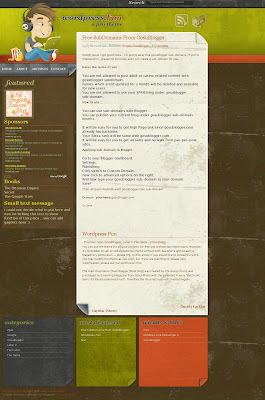 It was converted from the Wordpress.org theme by Lorelie and offers a beautiful template for those wanting a feminine approach to their design. Here is another stunning design which has been converted by Alvaris Falcon. 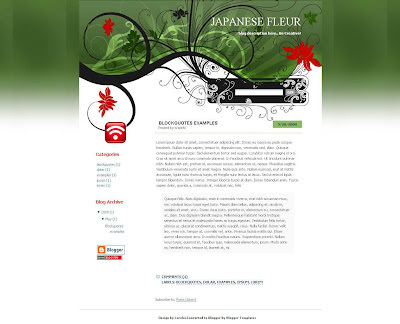 This stunning layout offers a Japanese theme with a wonderful background image for both the header and footer sections. It offers integrated navigation buttons, feed subscription link and search in the sidebar. 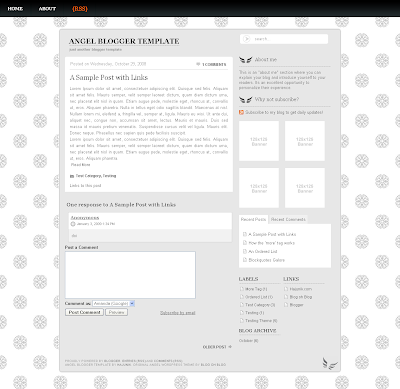 I'm sure you will agree this is a truly beautiful Blogger template! 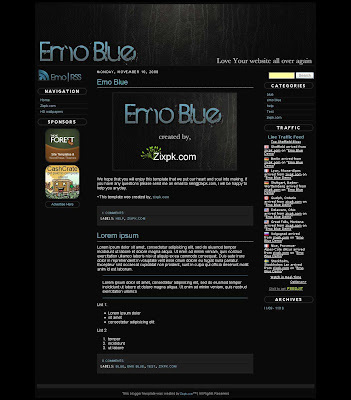 This original Blogger template is a dark and sleek design which features a subtle grunge design. 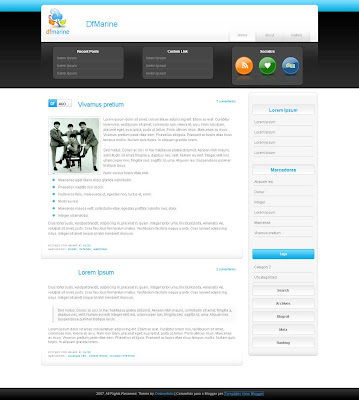 It is a three column layout with integrated feed links and search function and is fully widgetized. Gisele's templates are always beautifully designed (just take a look at her blog to see the best examples). 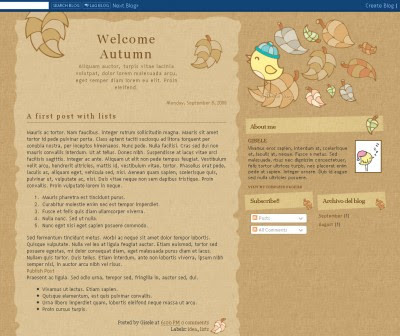 This autumn themed template features the familiar "Birdy" character above the sidebar and it's neutral color scheme enables this template to be used for a whole variety of blog niches. 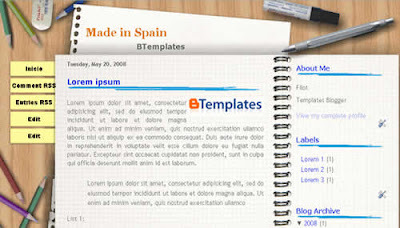 According to the statistics from BTemplates.com - the leading resource site for free Blogger template downloads - the Made in Spain template is among the most popular Blogger templates of all time, boasting almost 20,000 downloads from BTemplates alone at the time of writing. 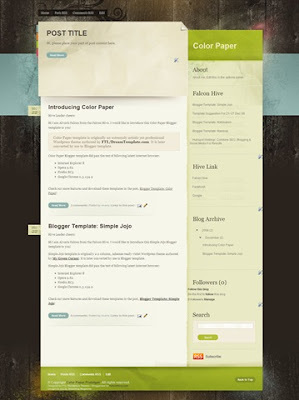 This two column template offers a notebook style appearance, tabbed navigation to the left of the main section (made to appear like post-it notes) and a fully widgetized sidebar. Here is a sleek and professional template which was converted from the original theme by Deziner Folio. It features a stylish three column section for links/bookmark icons below the header, a fully widgetized sidebar, calendar icons and much more. This fabulous template displays posts in rows of three, side by side on the home page, while on item pages the posts are expanded to fill the main area. 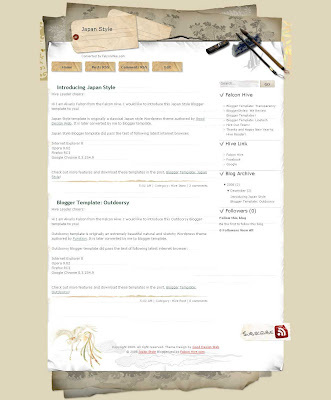 It includes a single sidebar to the right of the posts column and three widgetized sections in the footer area. Originally created by Evan Eckard for Smashing Magazine, I am awed by the wonderful conversion made by Magznetwork and truly recommend this template for those who desire an edgy, grunge style theme. While some of these templates may be familiar from my previous Blogger template articles, I've only recently discovered most of these templates and feel it only fair to share the best of my discoveries with you. There are dozens more beautiful Blogger designs I have encountered over the past year and this is my personal selection of favorites. So if you feel I've left out an outstanding design or would simply like to share your own favorite designs, please feel free to discuss this in the comments below.